It’s been a few months since I’ve imaged anything. There are a number of factors that play into that unfortunately fact, but the main one has been weather. I believe last night was literally the first cloudless night without rain in nearly four weeks. I had ordered a monochromatic CCD back in October that took some time to fulfill and the camera (with accessories) arrived just when the poor weather hit. Coincidence? On a brighter note, this allowed me to figure out I should purchase a new laptop, install all my AP software, and check connectivity and camera control from my dry desk indoors before spending a night in the field. This entire shift away from my unmodded, Bayered, one-shot-color DSLR to a set-point cooled, mono CCD is quite the endeavor for me. It not only requires new workflow in both image acquisition (per-channel imaging with potential for narrowband) and processing (drastically different integrations and post processing sequence), but it also has introduced new software since my user-friendly and intuitive BYEOS doesn’t work with the CCD. I decided to go with the STF-8300M from Santa Barbara Instruments Group. Part of the decision was based around great “bang for the buck” in capability and features, but mostly it was based on reputation and proven track record as being a “work horse” in the field. There were/are newer and improved models, but I really felt this would serve me well as a first dedicated AP camera. So, back to last night… I arrived at the Observatory around 6pm with plenty of time to set up all my gear and get things balanced. As soon as Polaris was bright enough for my amateur seeingballs to make out, I quickly did a polar alignment and waited for enough high mag stars to facilitate a 3-star alignment. This is where the fun began. First off, I had no idea how to do an alignment with the CCD. In the past, I used Live View on the DSLR and more or less treated it like an eyepiece of sorts. In lieu of this, I used the focusing tool in TheSkyX’s camera plug-in (what I’ve decided to use for now) and attempted to align. I botched the first alignment and couldn’t get on target, so I started over from scratch and used a handheld 520nm laser to aid in locating my position when off at each step. The second time around, I got the alignment spot on and was quite happy except for the fact that the entire process had taken well over an hour… but I learned a lot for the next time around. 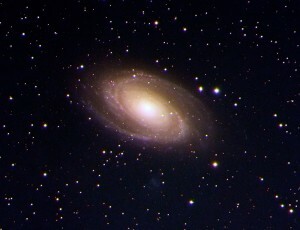 I decided to shoot Bode’s Galaxy since that was the first DSO I ever attempted when I started this hobby about 10 or 11 months ago. Since everything was new, I had no idea how long to shoot each sub or how many subs would be sufficient. I mean, more is always better, but I had no reference point. I decided, which more or less was just a complete guess, to shoot 10 Luminance subs binned 1×1 and 5 each Red, Green, and Blue subs binned 2×2. At the end, I also shot 5 Hydrogen-Alpha subs binned 1×1, but ended up not using them for now. I have so many questions. Anyhoo, the night could be summed up in two words… cold and wet. The temp dropped dramatically after sunset and the air was thick with moisture. We are coming off a month of rainy and dreary days, so there was no shortage of dew forming on every surface imaginable. I had my dew heaters on 100% power from the moment I thought they were holding up well, but when I looked at my data this morning, it is clear that the dew won. I also had “checked” my focus in between each channel run, but apparently not well enough. I can’t tell if focus had drifted or if the star bloat is from dew. I am leaning toward the latter because of the chromatic artifacts that shouldn’t be there from anything in the optical path. The registration/calibration and integration workflow in PixInsight is very different when starting with individual channels. There were a lot of challenges with this bad set of data I managed to bunch up last night. The first thing I noticed was the challenge of integration of linear versus non-linear data. I am not quite sure where you have to have transformed the histogram to non-linear before combines and where you can get away with linear data. The second thing I noticed (other than the focus/dew problems) was that I seemed to have a ton of hot-pixel looking noise for the color channels, but not for the luminance channel after registering and integrating the subs. The only thing I can think of that would be different is that I changed the binning to 2×2 for the RGB channels. Since binning down should improve signal to noise, I am not sure I get why I introduced this artifact… or if that is even what it is at this point. Of all the “schtuff” that came up along the way, this question is the most pressing on my mind. I’m sure my inability to leverage the Hydrogen-Alpha data will get solved with experience in processing. Which was the third baffle… I could not get PixelMath to map the Ha data into the LRGB data. I honestly don’t know if it is my integrated subs, if I input wrong wavelength filter bandwidth in the expression, or if there was some mumbo-jumbo going on with linear versus non-linear working spaces. There was also the star-mapping step to upsample the RGB channels to match the Luminance for the LRGB combination, so I used the same star-mapping method on just the Red channel for the PixelMath operation and that might have jacked something up. I really don’t know, so I just shelved the Ha data for now. In retrospect, I probably won’t shoot a separated Luminance channel next target. I’ll just shoot RGB unbinned. I’m also going to try to find some public domain data sets to practice the integration steps on better quality data. The fact that I got dewed out is disheartening because I don’t know how to beat it. I suppose I could double up on the heater strips and take a hair dryer with me to zap the front element of the OTA every couple of subs. Overall, it was a good “first light” on the gear. I learned a lot about the minor steps that will save me time the next time around. I learned a few areas I need to be more meticulous about checking throughout the imaging run. It’s easy to get bummed out with poor results like this, but when I look back to last May and what I’ve learned, I’m really excited to see where my images will be with another 10 months of practice.